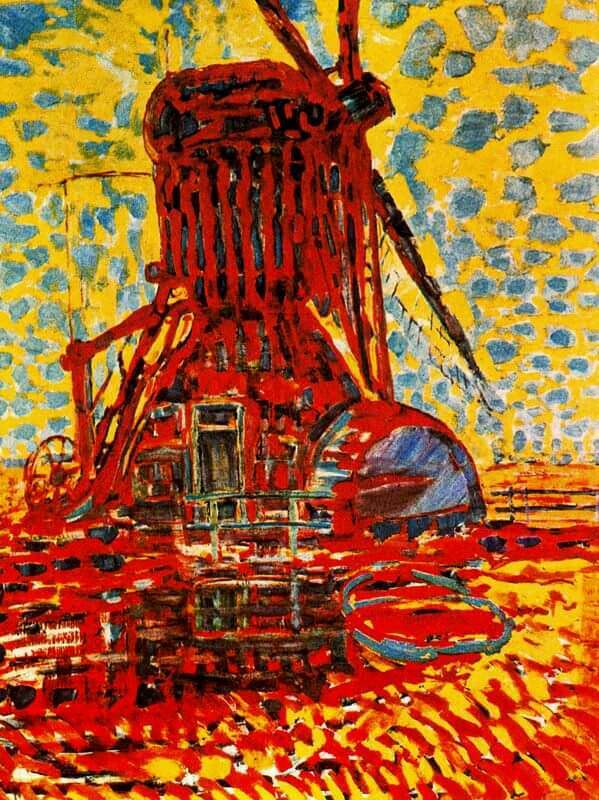 The windmill theme, which has such an important place in Mondrian's work, led him in 1908 to create one of his masterpieces in the new luminist style. Of all his luminist works, this picture perhaps exhibits the characteristics of the style most clearly, not only the technical, external characteristics, but also the inner, spiritual attitude that is so sharply rendered by the blazing sunlight. Most striking in this painting is the choice and shading of the colors. 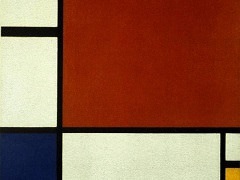 Although Mondrian uses a series of nuances and gradations, his palette is here actually limited to three colors: the three primary colors of red, yellow, and blue. 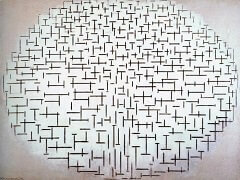 The significance of this limitation is that he is now experimenting with color in an effort to find the simplification and generalization that he had hitherto looked for mainly in form. In this he was aided chiefly by his contact, via his Dutch friends, with French fauvism and neo-impressionism. The Dutch art that had influenced Mondrian's early years was anything but coloristic; all of nineteenth-century Dutch painting was dominated by tonalism, in which the tonal value, the nuance, was regarded as more important than color itself. Of all the Dutch painters of the nineteenth century, only Van Gogh went beyond the limits of this tradition, and then only after he had come in contact with the new colorist school in France, the Impressionists. 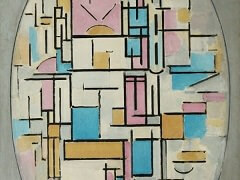 It is no accident that some people tend to discern van Gogh's influence on Mondrian in the Windmill in Sunlight. 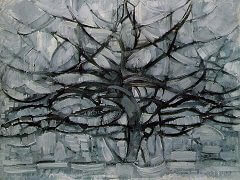 Mondrian certainly could have seen exhibitions of Vincent's work, the large one in Amsterdam in 1 905, for example, but it seems doubtful that the revivification of his color goes directly back to such an impression. 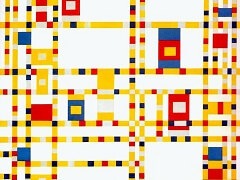 It is typical of the development of Mondrian's art and early twentieth-century painting in general that color was the initial step to renewal. For before turning to the problem of form, European painting as a whole first developed a new vision of reality through the fierceness, the expressiveness of color. 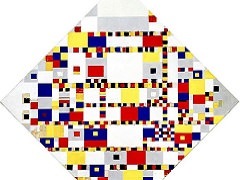 Just at the time when Mondrian was concerned with the revival and simplification of color, Pablo Picasso and Georges Braque in France had advanced to the problem of form, handling it in a way - cubistically - that was later to be important for Mondrian. 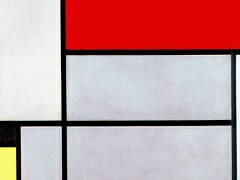 For the time being, Mondrian faced different problems. In 1908, with the Windmill in Sunlight, he succeeded in reducing all his joy in radiant reality to the bright-sounding chord, the triad of primary colors, in which his vision of reality, and his optimism, found expression. 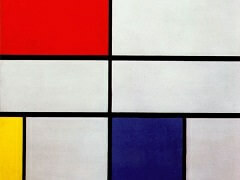 Copyright © 2011-Present www.Piet-Mondrian.org. All Rights Reserved.